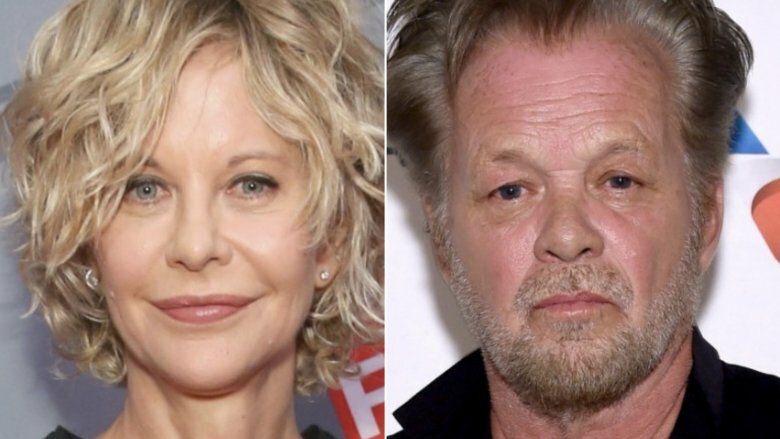 It's official — actress Meg Ryan and musician John Mellencamp are getting married! The Sleepless in Seattle star announced the big news on Instagram on Thursday, Nov. 8, 2018. Sharing a hand-drawn picture of (presumably) herself and her beau, Ryan wrote, "ENGAGED!" in the caption. As noted by Entertainment Tonight, rumors swirled that Ryan, 56, and Mellencamp, 67, were engaged to be married after Ryan was photographed with a sparkler on her ring finger on Halloween 2018. According to E! News, Ryan and Mellencamp first started dating 2011, but split in 2014. They reportedly got back together that same year, only to break up again in 2015. After they separated, Mellencamp told radio host Howard Stern that there wasn't much of a chance that he and Ryan would be able to work things out (via Page Six). "Oh, women hate me. I loved Meg Ryan. She hates me to death," he shared. He explained, "I think it's because I'm a child. I throw fits. I gripe. I complain. I'm moody. Every bad thing that a fella can be, that's me." Mellencamp added, "She just doesn't want anything to do with me," noting, "And I can't blame her." However, the two celebrities were said to have reconciled yet again in 2017. In July of that year, a source revealed, "They are together. It's been a few months." Earlier in 2018, the pair reportedly sparked rumors that they were planning their wedding, as they were seen near Daufuskie Island, S.C., where Mellencamp owns property, and apparently looked as if they were planning some kind of event. A rep for Ryan dismissed the claim to Page Six, saying, "Not true." Ryan and Mellencamp's wedding will mark Ryan's second marriage. She used to be married to actor Dennis Quaid, with whom she shares son Jack and adopted daughter Daisy. Mellencamp has been married before too. The father of five was previously married to Elaine Irwin, Victoria Granucci, and Priscilla Esterline.